Healthy Mug Soup is a simple and delicious vegetable egg soup. Add this to your lunchbox routine – It is a snap to prep, pack and cook in any microwave. Most days I bike in to work. In the fall and winter it can become very cold here in Boise. On those brisk mornings I like to bring something with me to warm me up after my ride. Enter Healthy Mug Soup. This is a simple, healthy recipe that provides a semi-hearty egg vegetable soup with lots of expansion options. The basic ingredients are bouillon, celery, carrot, and an egg but you can experiment to find your perfect morning pick me up. I personally use jalapenos, mushrooms, various meats including chicken, beef, and pork. It is nice to switch up the base flavor with different bouillons (Better than Bouillon brand bouillons are my favorite). When we have drippings from meat I add a little to provide some more breadth and richness to the flavor of the Soup. Bacon is the best of course. 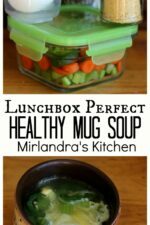 I recommend you experiment to find your own perfect Healthy Mug Soup. Feel free to tell me what you’ve experimented with in the comments below. I hope you enjoy this quick and convenient recipe as much as I do. Tools In This Post: These wonderful Glasslock containers are great for getting my food back and forth on my ride to work. 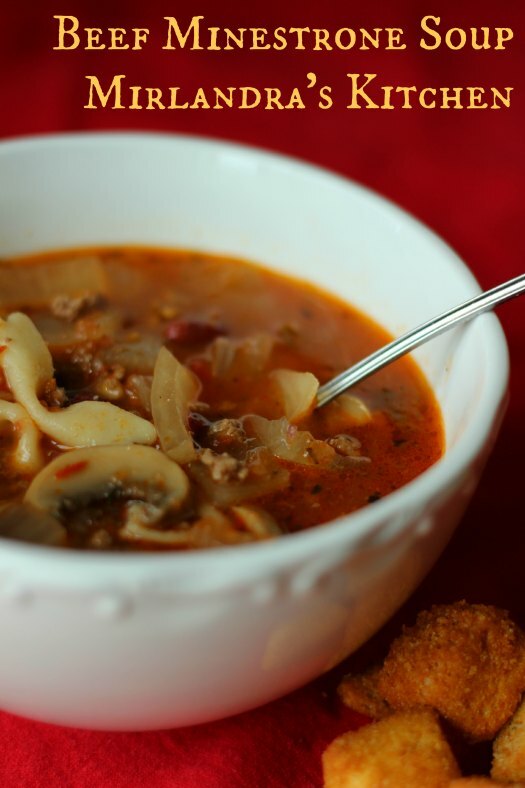 You might also love this healthy 30 minute Beef Minestrone Soup! 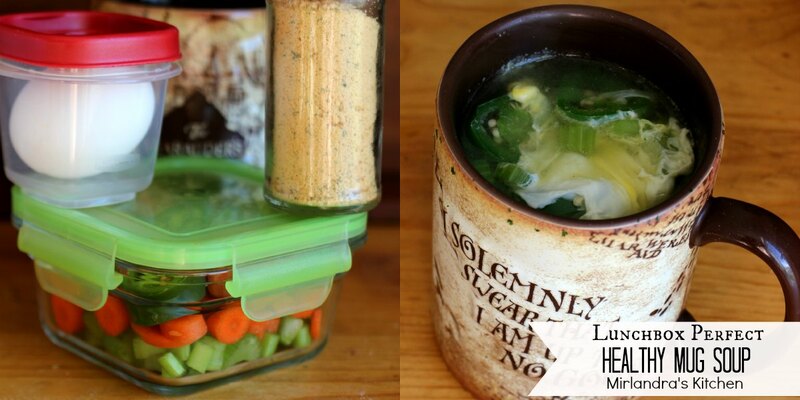 A quick and easy egg and vegetable soup you can make in a microwave. Put chopped carrot, celery, jalapeno peppers and bouillon into mug, making sure to leave at least 1" of space to the top of the mug. Add enough water to cover vegetables. The vegetables will cook down. Microwave on high for 3-4 minutes depending on the power of your microwave, watching to make sure that the soup does not boil over. Crack egg into mug, then stir gently. Make sure to break open the yolk. Microwave again on for 1-2 minutes. Make sure that the egg has cooked. Enjoy. The mug and soup will be hot. You can add many optional items to this recipe. I've made it with mushrooms, onions, beef, chicken, turkey, etc... You can also add in animal fat for a richer soup. I’m lovin’ this microwave meal craze ! I’m trying to find a cabbage soup version. Could ya help a guy out? Hey John! We have not done a cabbage one but I asked my husband (the post author) and he thought that would be wonderful! I don’t know when he will be able to get one up but it is on the radar. We are having a little girl in June so it might be later in the summer or early fall before we get to it. I’m so glad you are enjoying the soup!